CRKT and noted knife designer Ken Onion are proud to introduce the Aluminum Ripple K415KXP folding edc knife. The Ripple is noteworthy for its exceptional manufacturing quality, plus an almost unbelievable silky smooth and fast opening action thanks to the use of the IKBS internal knife ball-bearing system. The modified drop point blade has a high hollow grind, swedged top edge, and a high satin finish. Blade Steel is 8CR14Mov high carbon stainless steel with an HRC rating of 57-59. The blade is instantly opened by pressing the blade flipper with either hand. For safety while closed, the blade has a ball detent. Even the best conventional blade pivot bearings have some degree of friction which resists initial movement, or “stiction.” In contrast, the Ripple blade opening action is almost friction-free due to the IKBS ball-bearing system. This innovative and simple design places ball bearings built into the stainless pivot screw. It is compact and adjustable at the blade pivot screw if ever needed. Not only is opening and closing exceptionally smooth, the IKBS system is durable and requires little maintenance, and yields a folder with great rigidity and no blade play. The Ripple K415KXP model has locking liner. In typical Ken Onion attention to detail, the aluminum handles are CNC machined with over 40 lightening holes and small ripples. 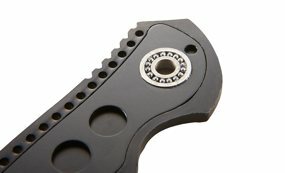 The handles are then hard anodized black and then the top of the ripples are polished off to create a pocket worn finish. Ken Onion designed the stainless steel clip so it tucks away nicely in your pocket for every day carry and easy access. This knife combines brilliant design, custom knife quality, and advanced manufacturing technology in true Ken Onion fashion. Columbia River Knife & Tool (CRKT) and noted knife designer Ken Onion combined forces to create the Aluminum Ripple folding pocket knife, which offers brilliant design, custom knife quality, and advanced manufacturing technology in true Ken Onion fashion. Noteworthy for its exceptional manufacturing quality, the Ripple also produces an almost unbelievable silky smooth and fast opening action thanks to the use of the IKBS internal knife ball-bearing system. The modified drop point blade has a high hollow grind, is swedged top edge, and is finished in high satin. Blade Steel is 8CR14Mov high carbon stainless steel with an HRC rating of 57-59. 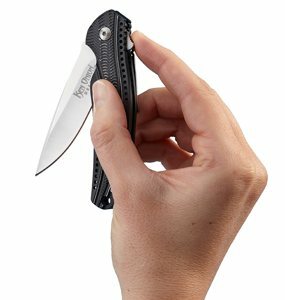 The blade is instantly opened by pressing the blade flipper with either hand, and the blade has a ball detent for safety while closed. The Ripple blade opening action is almost friction-free due to the IKBS ball-bearing system. This innovative and simple design places ball bearings built into the stainless pivot screw. It is compact and adjustable at the blade pivot screw if ever needed. Not only is opening and closing exceptionally smooth, the IKBS system is durable and requires little maintenance, and yields a folder with great rigidity and no blade play. The Ripple K415KXP model has locking liner. In typical Ken Onion attention to detail, the aluminum handles are CNC machined with over 40 lightening holes and small ripples. The handles are then hard anodized black and then the top of the ripples are polished off to create a pocket worn finish. Ken Onion designed the stainless steel clip so it tucks away nicely in your pocket for every day carry and easy access. IKBS ball bearing opening system (view larger). Ken Onion made his first knife in November, 1991, and designed his first folder in 1996 while recovering from back surgery. The result was the first assisted opening knife called Speed Safe. After finding some information on the whole patent process and consultation from an attorney, he got his first patent, creating a whole new category of knives between manual and auto. Founded by Rod Bremer in 1994 and based in Oregon, Columbia River Knife & Tool (CRKT) offers a broad line of sport, work, and professional knives and tools that are purpose driven designs. All CRKT knives and tools are built incorporating the most advanced equipment and production systems available. And the most innovative custom knife makers and designers in the industry have created CRKT knife, tool and accessory products. Includes stainless steel pocket/gear clip (view larger).